The BBC Sports Personality of the Year is always a keenly contested affair with the very best athletes from all sports represented at this prestigious annual awards ceremony. The 2012 shortlist of 12 contenders - largely aided by the London 2012 Olympics and Paralympics, was nothing short of phenomenal. To be honest, any one of those nominated would have been worthy winners but the nation (quite rightly) decided that cyclist Bradley Wiggins, who was the first Briton to win the gruelling Tour de France as well as scooping Olympic gold in the road race, should claim the overall top prize. Behind him it was widely predicted that either Mo Farah or Jessica Ennis (or indeed both) would be voted in the remaining top three positions. In the end, Jess duly took second place and tennis player Andy Murray went away with third. 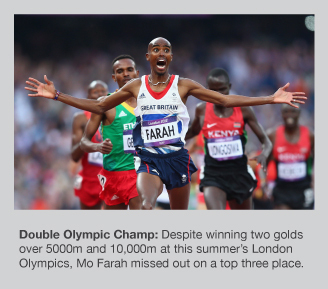 With stunning runs to win both the Olympic 5000m and 10,000m crowns to complete a memorable double, Mo enjoyed a sensational year and arguably achieved more than Heptathlon champ Jess, however the British public clearly disagreed. Yes, Andy Murray was Britain's first male Grand Slam winner for 76 years and also took gold at the Olympics so he was well and truly justified within the top three but if one athlete was going to appear then surely it had to be Mo. You could argue that there was more pressure on Jess to deliver as the poster girl and pin-up athlete of the host nation but Mo's achievements must be considered superior. Up against the best that east Africa's Kenyans and Ethiopians could throw at him, Mo became the first Briton to win either the 5000m or 10,000m at a global championships. To succeed in both at the Olympics makes his accomplishment even more formidable. Maybe the British male population was swayed by Jess's striking looks and some would have taken into account that the Heptathlon is a hugely demanding two-day event... whatever the reasons, it's a real shame that Mo missed out on a 'podium' finish at the Sports Personality awards after creating his own two special pieces of history within the space of one magical week. At least we can all agree that both Jess and Mo delivered when it really mattered on the world stage and their performances will always be remembered.